The story making the rounds of the translation industry today is yet another indication of the power of bad translations. 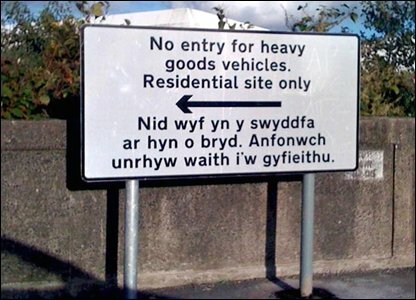 I've already received 12 e-mails with links to the BBC story of the bilingual road sign in Wales that reads "No entry for heavy goods vehicles. Residential site only" in English, but "I am not in the office at the moment. Please send any work to be translated." In Welsh. This story falls in the same category of the Chinese restaurant that used a free machine translation website to convert its name into English and printed a giant sign for its façade saying "Translate server error." In terms of viral capacity, this story will probably rank in the same category of the Berlitz video for its language schools in Germany, which clogged my mailbox with its 3MB everytime that it was sent to me (By the way, if you want to circulate a funny video, check first if it wasn't already published in YouTube... it's much easier to just send the link than add the video as an attachment to your message). Now seriously, what do we learn from this? Translation is for professionals. I can hear the linguists around the world jumping to use this as proof that machine translation doesn't work. Well, the Welsh story is actually just an Out-of-Office reply that the client thought was the translation for the text he or she requested. The client actually sought a professional to do the job. Machine translation should be a productivity tool. If you follow my postings or presentations, you should know by now that I believe that translators should use MT to improve their productivity and it is only useful if you know the language into which the text is being translated. The second picture is a clear example of a person who did not have any command of English and trusted the internet to translate his sign. Signs continue to be a translator's best friend. Before the internet, stories about bad translations in hotel signs were a favorite past time. They circulated by letter, telex and later by fax. Only bad translations make the news. When was the last time you saw a story about a good translation? Did you ever?